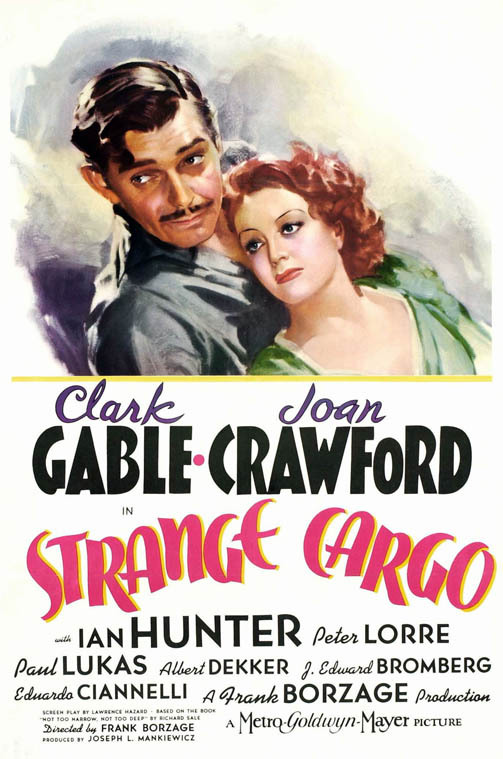 It's Duck Soup: Strange Cargo, indeed! Clark Gable makes what's possibly the most dramatic entrance of his screen career in Strange Cargo (1940), a typically good-looking prison escape thriller from MGM that mixes jungle trial and tribulation with implausible romance and even more implausible bible-thumping deo-literalism. I watched it last night as a guest at the home of my friends C____ and S____, who were part of that Quat Confusing Team that cared for my youngsters whilst I was away during my several stays at 4 East. Long before the bibles start to get thumped, long before the nefarious Eduardo Ciannelli, known to me primarily for his turn as the title character in, ironically, Republic’s fifteen-part serial Mysterious Doctor Satan, even pulls the first bible out of his prison uniform, we get to see Gable being released from his solitary-confinement cell on Devil's Island. As the door opens, all we can see are a pair of angry eyes staring back at us out of the darkness. Slowly he steps out into the light -- an action that all by itself prefigures the picture's theme -- to reveal a bowed but very much uncowed and unbroken prisoner ready for more punishment. By comparison, Joan Crawford's entrance into the picture a few minutes later down on the colony docks is a terrible come-down, although a tenacious Gable does get a nice toehold, so to speak, on her ankle. She has the added disadvantage of having a lot of scripted baloney to slice through: I can't honestly think of many women who wouldn't start hollering for the gendarmes the moment(s) that Gable enters her life. But, of course by design, she gets more and more beautiful as the movie progresses, and it's nice to see her looking and acting so well, like someone you would actually want to date. To my own personal embarrassment, I'm afraid that I didn't see where this tenaciously hokey picture was taking us until quite near the end, when it was lopped into my face like a big cream pie and twisted and pressed and twisted some more just to make sure that I understood that I'd taken a pie in the face. It was a case of my thinking, Naw, they wouldn't go there, would they? Only to learn, Oh, yes they would.